SuperData also cited Fortnite as a key factor in pushing digital games revenue up 11% to $109.8 billion across Mobile, PC and Console. Mobile was the lead digital games platform overall, with $61.3 billion of the market, followed by PC with $35.7 billion and Console with $12.7 billion. 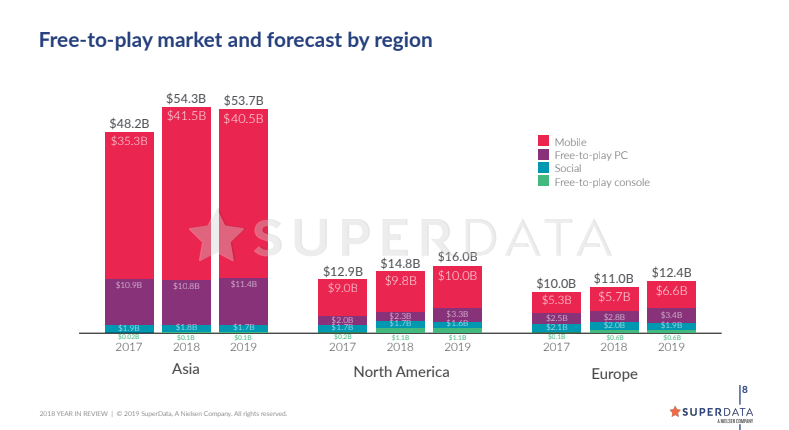 The dominant business model was free-to-play, which accounted for 80% of all digital games revenue in 2018 -- around $88 billion in total, of which 62% was earned in Asia. However, the biggest movement was in free-to-play console games, which generated 458% more revenue last year than in 2017. SuperData again pointed to the Fortnite factor as an explanation for that huge growth. Inevitably, the digital premium games market was much smaller than free-to-play, but at $17.8 billion in annual revenue (up 10% over 2017) it remains a significant sector. It was also a sector dominated by Western territories. North America and Europe contributed four of every five dollars (80%) spent on premium games in 2018, driven by the steady migration of sales from physical copies to digital downloads. PlayerUnknown's Battlegrounds earned more digital revenue than any other premium game in 2018, and around 19% more than its own total from 2017. SuperData pointed out that PUBG's $1.028 billion total did not include its free-to-play mobile version; the combined amounts would likely put PUBG among the highest earning games of the year overall. EA Sports' FIFA 18 finished in second in the premium chart, but Red Dead Redemption 2 was the highest placing game that didn't belong to an annualised franchise and doesn't strictly operate as a service. The $516 million earned by Rockstar and Take-Two's hit open-world title was enough for fifth place, and Red Dead Online is likely to improve the IP's earning potential in 2019. It is also worth noting that Grand Theft Auto V was in third place, despite launching in 2013. A potential growth area for 2019 is the emergence of subscription services, similar to Netflix, for video games. The most prominent examples are Microsoft's Xbox Game Pass and EA's Origin Access Premier. According to SuperData, the top three subscription services earned $273 million worldwide in Q3 2018. Update:An earlier version of this article drew from non-finalized data that has since been finalized. The piece above has been corrected to reflect the most recent and complete data.